In December of 1960, the Chicago Tribune included a small snippet announcing the opening of a brand new hotel in western Chicago. That hotel was the Ohio House Motel. After more than 5 decades, the Ohio House Motel is still going strong. Previously owned by the Chicago Board of Education, the property on which the Ohio House Motel sits today, used to be a school. In 1959, Miller Development Company proposed a 48-room motel to be built on that property. 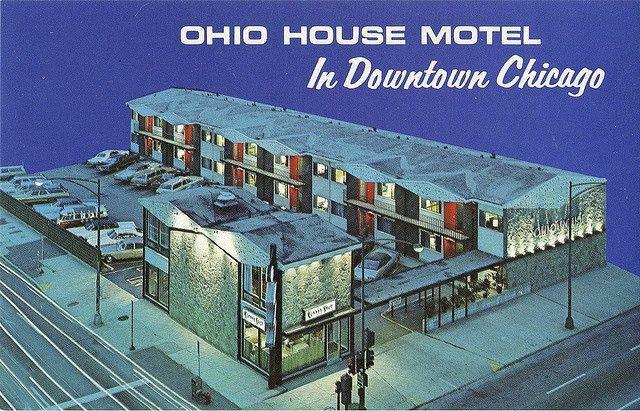 The cost to build the Ohio House Motel was $500,000 or roughly $4 million today. The motel was designed by lead architect Arthur Salk of Shayman and Salk. Salk designed other hotels in the area including the Summit Motel and LaSalle Motor Lodge. Throughout the 1980s and 1990s, the neighborhood surrounding the Ohio House Motel was dangerous and unappealing. At the time the owner of the Ohio House Motel planned to demolish the iconic motel and build a much larger chain hotel. In 2001, the motel’s demise was imminent. However, thanks to gentrification and new development, the neighborhood became a hotbed for new businesses and tourism. Plans for the demolition of the historic motel were never carried out and the Ohio House Motel continues to provide comfortable, clean, and affordable hotel rooms located in the heart of Downtown Chicago. Ohio House Motel in Chicago allows guests to get the best of both worlds in River North. Located in the heart of Downtown Chicago, Ohio House offers guests multiple options to fit any traveler’s budget and needs. Built in the 1960s, the Ohio House Motel in the River North neighborhood of Downtown Chicago is the area’s only true boutique hotel. Offering modern hotel rooms in a vintage Americana structure, chain hotels just don’t have the character and charm of Ohio House. Guests who stay in our deluxe rooms will enjoy a taste of luxury just steps away from the heart of Chicago. Ohio House Motel in Chicago prides itself on, not only offering clean and comfortable hotel accommodations but also ensuring our guests get the best possible rate. Guests who book directly have access to free parking, free wi-fi, and free breakfast. Book one of our clean and comfortable standard rooms and score our best possible rate in the heart of Chicago.